You can never have too much of stylish jewellery! Talking about stylish, how about a champagne pearl necklace? The sad fact prevails that we cannot afford every piece of jewellery that hits the market. That’s when we need to improvise on the resources that we already have at hand. Thus, whenever we purchase jewellery, we think about the versatility and utility of the piece. 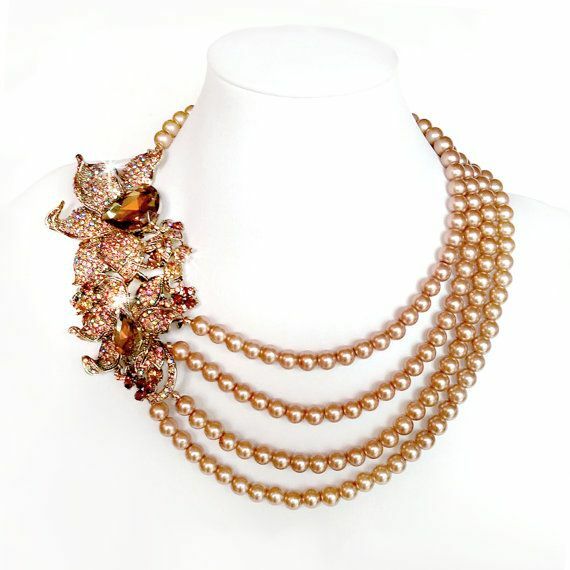 By far, pearl necklaces are the most useful and resourceful item that you can use in many ways. Whether it is wrapping them around your wrist to make it a pearl bracelet, or getting a long string of pearls and layering it up to make a dramatic neck piece, the possibilities are endless and up for exploration! First of all, Champagne Pearls are basically Golden Pearls having champagne overtones. The exotic pearls are lightly coloured and have hues of Gold, Rose, and Silver. These pearls are a sign of affluence and prosperity. They are supposed to bring great luck to the wearer and are rare in occurrence. In fact, their rarity and virtue of bringing good luck was celebrated by the ancient Chinese, who often depicted their sacred dragons bearing golden pearls in their claws and mouths. On tough days when you wish to have a bit of luck or for important meetings and presentations, put on your champagne pearl necklace to attract good luck while appearing confident and regal. A champagne pearl necklace is the kind of item that you can wear throughout the year and with any kind of outfit. From board meetings to casual outings to fancy dates, a pearl necklace is a handy companion in all settings. Champagne pearls are particularly suited for those having blonde hair. Due to the shades of golden, they look stunning on those having olive or dark complexion. They can be worn on traditional attires and modern, contemporary outfits. Weddings having the traditional white and gold themes can witness and welcome the champagne pearls as a breath of fresh air. Champagne shades also complement other white pearls that have rose or pink overtones, so you can be open to mixing and matching these pearls. However, if you are still looking for ways to include a champagne pearl necklace in your wardrobe, the following styling tips can get you started! For black tie events, simple is elegant so pair your champagne pearl necklace with a pair of matching earrings. Wear something sombre like a plain string of pearls. If you are opting for a timeless classic look, choose a black high neck gown or jumpsuit to redefine sophistication. Pearl necklaces make great office jewelry, you can easily wear these without looking over-the-top or tacky in professional environments. Consider wearing pearl necklaces that are not too loud and obvious. Pair your champagne pearl necklace with pastel coloured blouses like blush and rose. You can make a striking impression on a date night if you decide to pair your champagne pearl necklace with the classic little black dress. Wear a short strand of pearls for a dress having a low neckline while for a high neckline, pick out a longer strand. White pearl necklace could also be your standard substitute. Feel free to layer necklaces for a bold statement jewellery piece. Pearl necklaces can accentuate your casual blouse and reward you with a charming appearance. If you wish to draw attention to your neckline, then you can use multiple strands of pearl necklaces to achieve that effect. Do not be limited to just champagne pearls, in fact, mix and match with your outfit. Mix and match or pearl necklaces with other colours (like white and black) or even other gemstone necklaces, it gives an effortlessly casual yet stylish appeal. Wear a champagne pearl necklace only if you are wearing a wedding gown of the same shade. Wearing contrasting or different shades may shift the focus to just the jewellery, away from the wedding gown, which you would have picked out after careful consideration. However, you can use complementary colours too, such as a champagne pearl necklace with a royal blue wedding trousseau! 14 inches pearl strands: These pearl necklaces will fit tightly around your neck and will therefore suit V-necks, boat necks, off shoulders, scoop necks, and cowl necks. 16 to 18 inches pearl strands: These pearl necklaces will have their fall near the base of the neck and the collarbone respectively. These are ideal for almost all types of dresses and all kinds of necklines. This length offers the greatest utility. 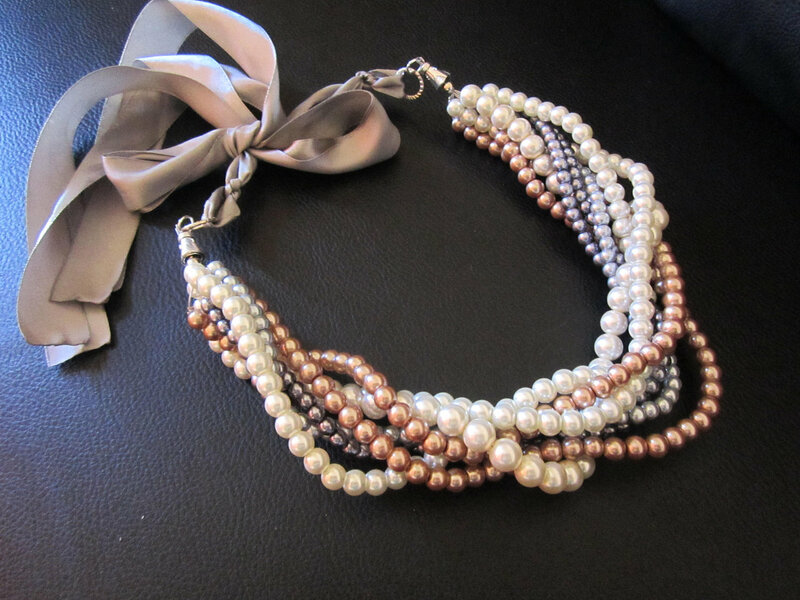 20 to 24 inches pearl strands: These longer pearl strands are suitable for business or casual wear. Put them on while heading out to work or while hanging out with friends. 28 to 42 inches pearl strands: These pearl strands are best suited for glamorous events and do very well with evening gowns or dresses having high necklines. Feel free to layer them up for a statement piece. This length offers the most flexibility. We cannot stress this enough but layer up! Layers of pearls not only look elegant but the layers of strands are also enchanting, to say the least. You may knot the bottom of your long pearl necklace strand. Form a loop and pull the pearl strand from the loop. Tie a gentle knot and you are all set to dazzle. Add twists to very long pearl necklaces. Use pearls strands of various sizes for a visually cascading effect. A short strand with large pearls can be the statement piece supported by longer but smaller pearls. If you wish to achieve this look for a casual event, you can try out different shades of pearls. Think of how stunning the champagne pearls will look when complemented by blue bead strands. Like we said before, stack your pearl necklaces with other gemstones. Pearls can soften the look of vibrant and bold gemstones like sapphire, diamond, or amethyst so you can complement the stones with the pearls. The stark contrast between the champagne pearl necklaces with the sparkling of diamonds and other gemstones would bedazzle your ensemble. Spice up your pearl necklace by adding diamante (or real diamond) brooches. You can use multiple brooches but do not go overboard and hide the pearls. Adding the pins will offer a distinct look to your pearl necklace without the involvement of any radical changes to the necklace. If you wish to have a perfectly edgy look, pair up your plain pearl necklace with a trendy spiked choker. Choose a length that allows your necklace to perfectly sit inside the choker. For a champagne pearl necklace, opt for a choker that is either silver (for contrast) or golden (for uniformity). For an absolutely classic old time look, you can decorate your pearl necklace with a corsage. In fact, you can pin your necklace to the dress with the corsage. It will keep the necklace in place. Chunky pearl necklaces can be made by twisting a long strand of pearls and wearing it around your neck. You can clasp the ends together using a pretty vintage brooch. Using a similar brooch, you can also make it the focus of your choker using multiple layers of a long strand of pearls. Champagne pearls will look stunning with sapphire and turquoise coloured brooches. So that’s all for styling your champagne pearl necklace. You can colour coordinate other pearl necklaces depending on your outfit and use these tricks to have the same effect. Remember to have fun with pearls and do not feel restricted while wearing them. The most important part of any discovery lies in the boldness of trying out new things and the same goes for wearing and trying out new things with your pearl jewelleries.